In harmony with the character and charm of the 1930s building, the new extension was designed with clean, sharp lines. A combination of concrete, glass and steel gives it a cool, contemporary edge while the structural poles blend with the original building fabric.The extension’s structural concrete slab is a striking feature and highlights the contemporary aspect of the new addition, while other earthy materials, such as timber-clad walls, marble and encaustic tiles, mirror elements of the original house. 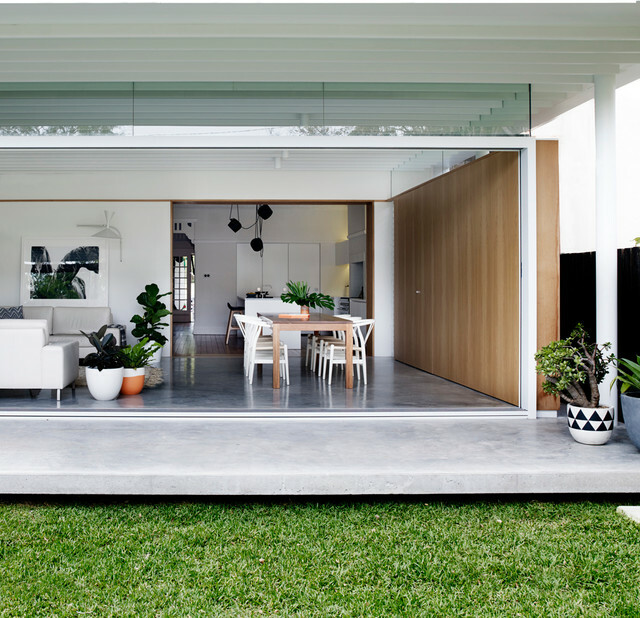 verandah is the same level as the interior floor and hangs over the lawn. - great for our extension and a step down to the Eastern pergola area?